Sagtikos Parkway runs between Northern State Parkway and Southern State Parkway thus closing the gap between their eastern ends. The Sagtikos State Parkway was completed in September 1952 and it fulfilled the need of a closed, connected parkway system forming a loop. 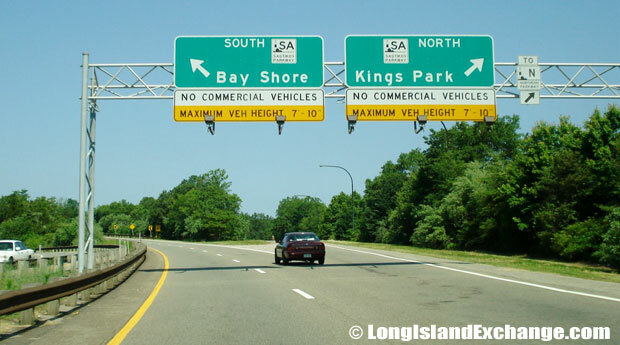 Presently, the Sunken Meadow-Sagtikos-Robert Moses roadway is the only road that runs in the north-south direction that is a fully controlled-access highway in Suffolk County. Sagtikos Parkway Northbound from Pine Aire Drive south of the Long Island Expressway. 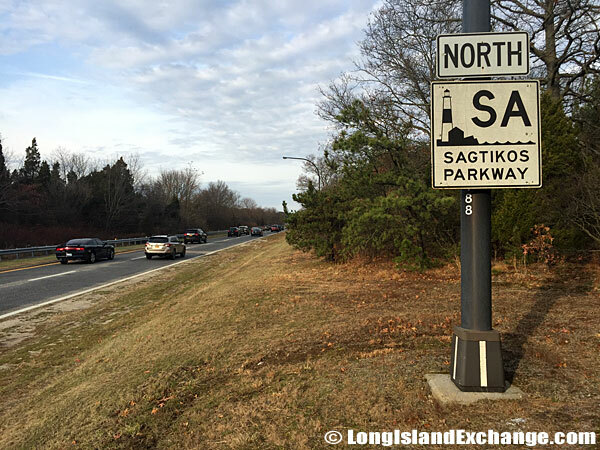 The Sagtikos State Parkway continues as the Sunken Meadow State Parkway to the north of the Northern State Parkway. Similarly, the Sagtikos State Parkway continues as the Robert Moses Causeway to the south of the Southern State Parkway. The parkway has fulfilled a longstanding local need and was in the planning stages for over twenty years. Fortunately, the construction process took just over two years at a cost of $8 million. Sagtikos Parkway Entrance from Westbound Long Island Expressway, Commack. Today the Sagtikos State Parkway comprises of 24-foot-wide roadways with two lanes in each direction. They are separated by a nine-foot-wide grassed median. The roadway has mountable three-inch-high curbs that allow disabled motorists to move off the parkway onto the shoulders. Aesthetic landscaping with trees and shrubs has helped improve the appearance as well as reduce sound and air pollution in the neighborhood. 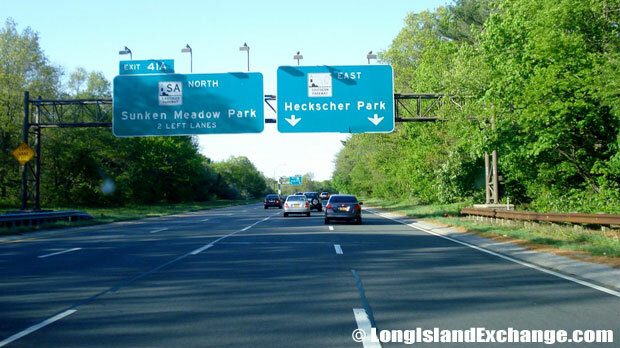 Sagtikos Parkway Northbound at Heckscher Park Split, North Babylon. Despite two decades of planning, the roadway needed modification to improve its utility and efficiency. Maintenance was handed over to the New York State Department of Transportation (the NYSDOT) in 1977. The NYSDOT made modifications to the parkway to accommodate the increase in traffic volume and speed, and to address the problems that were giving rise to several accidents. The department carried out changes necessary to comply with the traffic safety guidelines of the federal agencies and the state of New York. Sagtikos Parkway Northbound towards Long Island Expressway, Brentwood. Sagtikos Parkway Southbound from Crooked Hill Road, Brentwood. Changes and improvements are part of the maintenance of any road. New MUTCD-compliant signs and high-intensity lighting installed along the length of the parkway, during the late 1980’s and early 1990’s, improved its safety. A new concrete (“Jersey”) barrier replaced the timber-post guardrail along the center median and sand-filled impact attenuators were placed at overpasses to reduce damage in the event of an accident. A $12.4 million expansion of the INFORM system on the Southern State Parkway, between NY Route 110 and the Sagtikos Parkway was completed recently. Sagtikos Parkway Southbound to Pine Aire Drive Exit, Edgewood. 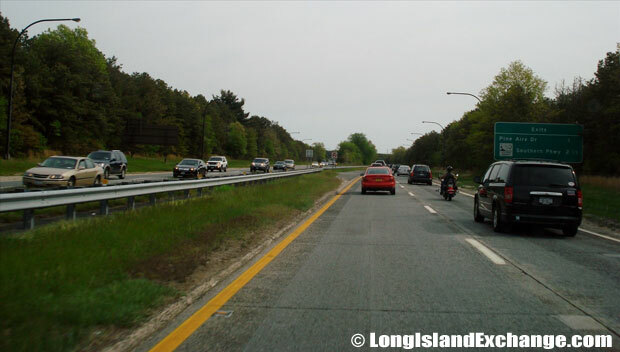 Changes at the interchange between Sagtikos Parkway and the Long Island Expressway (I-495) were necessary when the flyover was built through western Suffolk County. New “fly-over” ramps and service roads were added. Ultimately a new third travel lane in each direction along the length of the Sagtikos State Parkway will be necessary with perhaps two lanes exclusively for HOV s. Currently trucks do not use the parkway but perhaps this may change in the future. Sagtikos Parkway Southbound to Southern State Parkway, Brightwaters. NYSDOT and the Long Island Rail Road (LIRR) have plans for an inter-modal facility on an existing LIRR spur. Freight for local delivery would be delivered by train to the site and transferred to trucks. One option would be to open Sagtikos State Parkway for trucks traveling to and from the inter-modal site. This would of course necessitate rebuilding the existing Sagtikos State Parkway adding at least one additional lane in each direction and building new bridges.